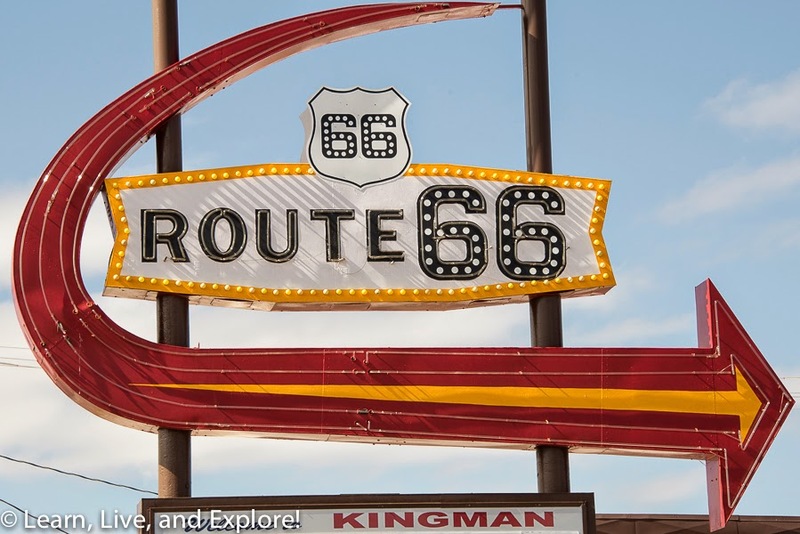 Route 66 Kicks: Day 4....Flagstaff to Santa Monica ~ Learn, Live, and Explore! Much like Day 3, the final day of this quick Route 66 road trip was going to be filled with lots of driving, through western Arizona and a cross cut of California to Los Angeles. There are many ways to make this segment longer, if desired, by including a side trips to the Grand Canyon for example or by following the original Route 66 roads that wind around the mountains and in less inhabited areas, but I opted to stay on the quickest course. I'm sure I'll get some flack from the purists for how much I skipped of the Mother Road on this section, but it's the way that suited me the best. And I still feel like I got to see a lot of the remaining sites. The first stop of the day was the famous Delgadillos. 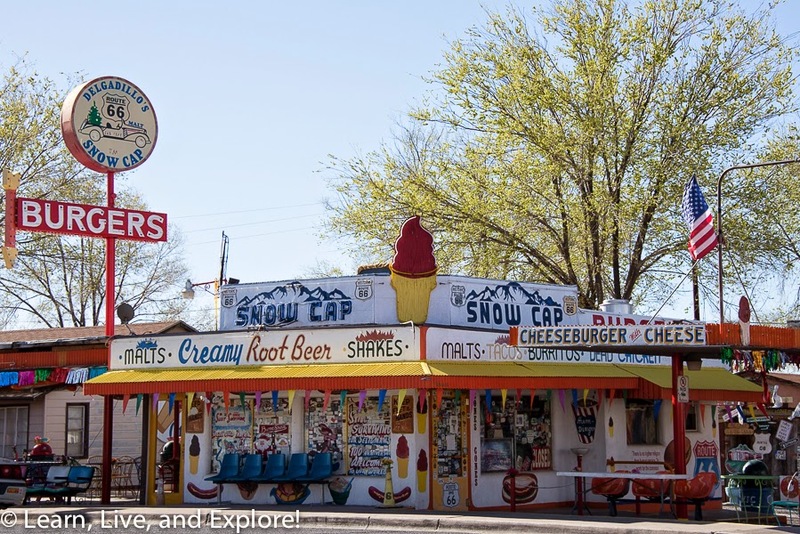 This popular drive-in restaurant was built in 1953 and was made famous by its lively owner who drew attention with his wild decor choices and by his crazy names on his menu. Apparently, he was quite the jokester! Kingman is called the Heart of Route 66, but I'm not exactly sure why. Maybe it's because it's one of the first major towns after the long, desolate stretch of the westbound road through eastern California. Perhaps it's because it's on the longest, continuous stretch of what remains of the original Mother Road (158 miles), of which 52 miles - from Kingman to the Colorado River - is full of switchback hairpin turns that were once used by dustbowl victims in the Great Depression as their route to new opportunities in California. 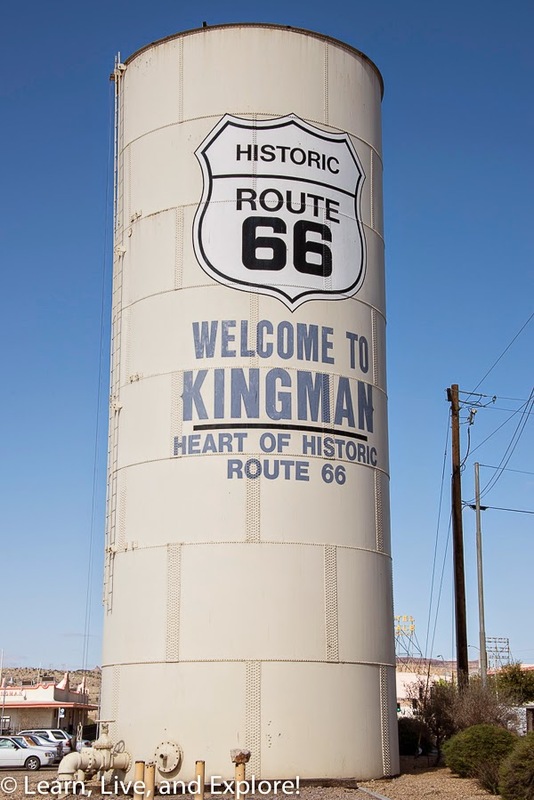 Kingman today doesn't have much left in it for Route 66 travelers, save for the museum, a water tower, and a neat neon sign (not historic) that I used at the top of this post. I decided to stop in Ludlow primarily because it was a good break after the long drive past the Mojave desert, but also because Ludlow was a great name that also happened to be the name of my parent's beloved cavalier king charles spaniel that passed away. 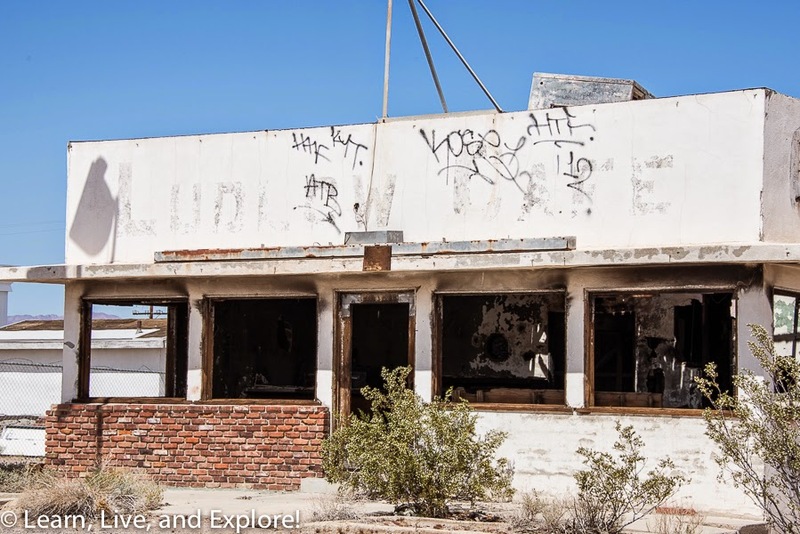 The Ludlow Cafe, or what little remains of it, was once a popular dining spot on Route 66. 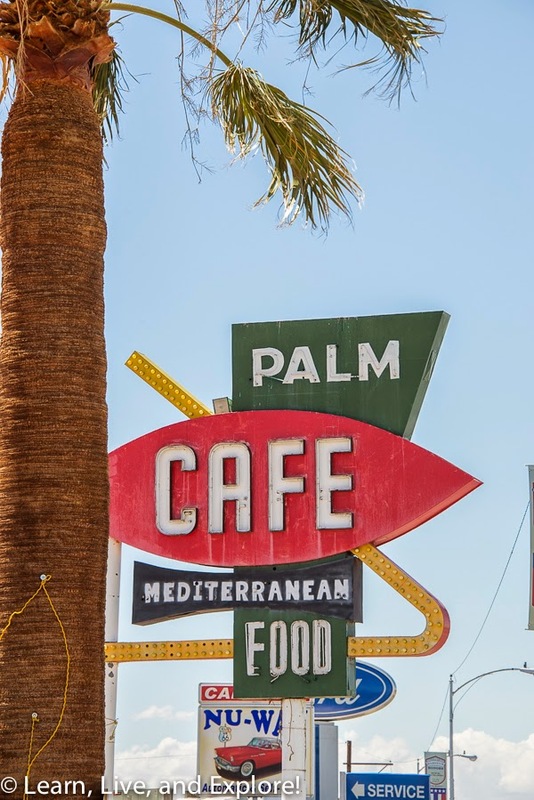 Always seeking out fantastic retro neon signs, I knew I had to stop at the Palm Cafe at 930 W. Main Street. I just love the great yellow arrow, even though I apparently cut it off with the palm tree in this photo. As I mentioned in my Day 3 report, the Wigwam Motel was a chain of seven similar motels, two of which remain on Route 66 today. This one in San Bernadino at 2728 W. Foothill Blvd. is #7. 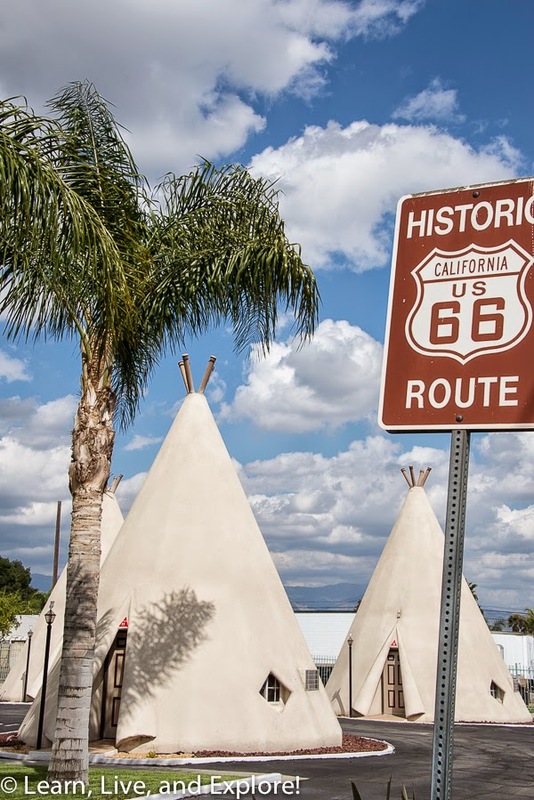 If you've ever dreamed of staying the night in a large concrete teepee, this is your place! Due west on Foothill Blvd. near Rancho Cucamonga (15295 E. Foothill Blvd.) 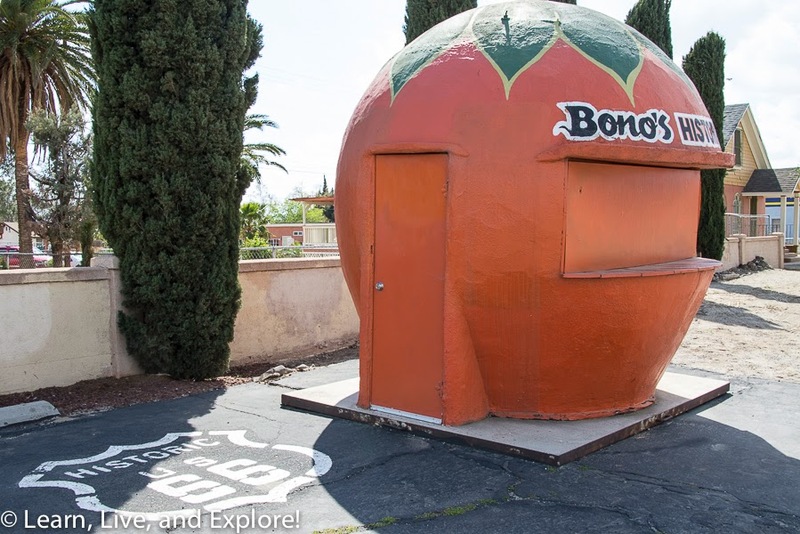 is one of the last remaining California orange stands. These drink stands were very popular in the 1920s through the 1950s as destinations for thirsty travelers, who could pull over for a quick glass of fresh orange juice made from local orange groves. Interstates and the demolition of the orange groves to make room for housing developments were catalysts for the demise of these drink stand franchises. 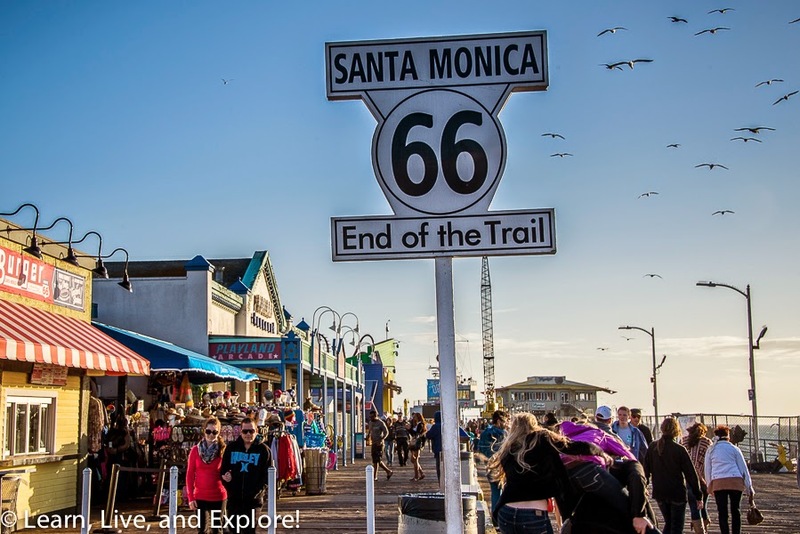 The most scenic way to get to the end of the Mother Road, on Santa Monica Pier, is to just take Foothills Boulevard to Pasadena, then take the 110 past Dodger Stadium into Hollywood on Sunset Boulevard, before taking Santa Monica Boulevard through Beverly Hills to the beach. OK, it's a little more complicated than that, but it's a good approximate route. 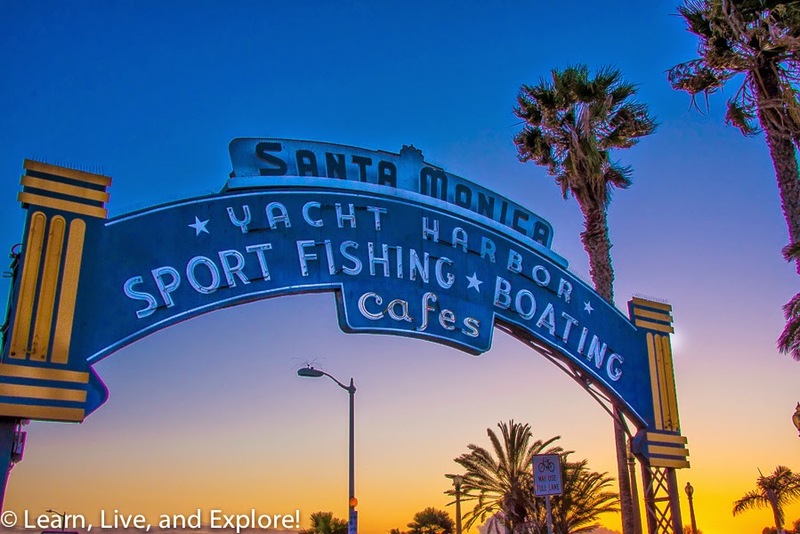 After finding a parking spot, walk to the intersection of Ocean Avenue and Colorado Avenue and take the walkway down to the pier that starts under the famous Santa Monica Pier. You can't miss the "End of the Trail" sign! Planning this four day adventure was not easy. There is so much to do and see along this 2,451 mile historic road; and, to whittle it down to only what was practical in order to keep the start to finish time to under a reasonable amount of time for one day - which can range from 10-11 hours for me - was a challenge. Of course, I wanted to see it all! And, of course, I wanted to drive it all! But I had only 4 days, which meant sacrifices. 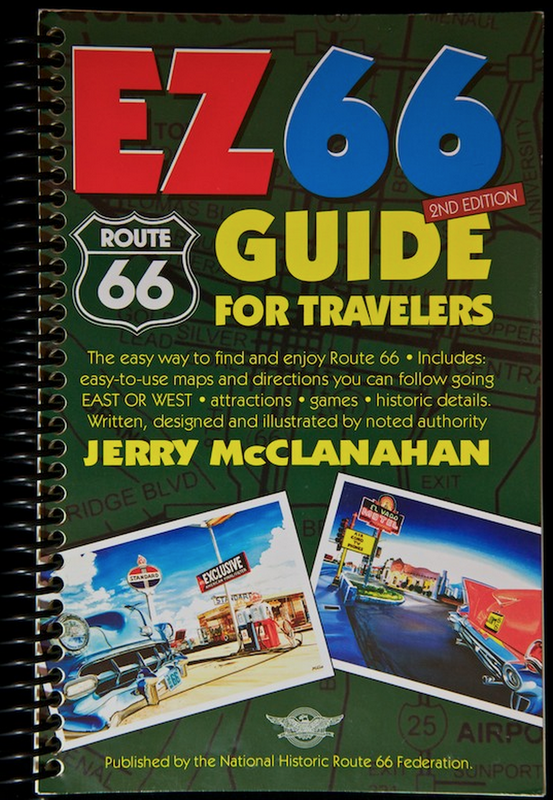 So, to get my final "must see" list for each day, I relied heavily on internet research, obviously, and I purchased the "EZ-66 Guide for Travelers" by Jerry McClanahan, which contains step by minute step driving instructions and historic site alerts. My copy of that book is quite dog-eared and marked up! One day, I know I will try this drive again with more time, so I'm looking forward to finding new things and exploring new towns that I had to pass up on this first attempt at Route 66.